Perfect location , ideal for short stay , dorms , bathrooms are good but no air-con in rooms. The kitchen is small but contains everything you need. Besides for Western visitor the cafes and restaurants are good for price. 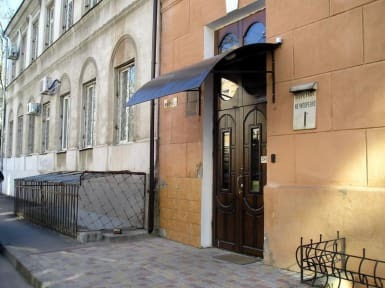 2 mins from hostel is The Spoon cafe which serves wide variety of fresh Ukrainian/Russian food. Many eateries and bars in close proximity. Rooms smelled really bad. Bathroom smelled too, and didn't seem to be cleaned that often. Worse though: Some of the beds aren't really beds but mattresses! (I actually can't believe they charged money to sleep on those). 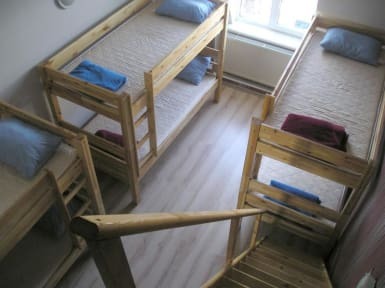 The staff were friendly, but almost didn't speak any english at all, which is crazy for a hostel receiving travellers. In addition to that, they had a big sign saying they charge extra if you stay out till after 2 am (which no other hostel has). It's cheap, but not worth it. First of all the biggest problem was staff. They were mean and they weren't helpful.They want extra money from us coming after 1 and when we are checked in they didn't mention about it.Second of it their bathroom was smelling so bad that we hardly enter it and the bathroom on the picture isn't correct they have another bathroom diffirent from the pic. Honestly only good part of hostel was its location.